Canadian Aquaponics - Canada's Source For Aquaponic Information and News: What is Aquaponics? The word aquaponics comes from the combination of aquaculture (fish farming) and hydroponics (growing plants without soil in nutrient rich water). But aquaponics is much more than the combination of aquaculture and hydroponics. It is an ecosystem that also includes multiple colonies of microorganism that are essential. 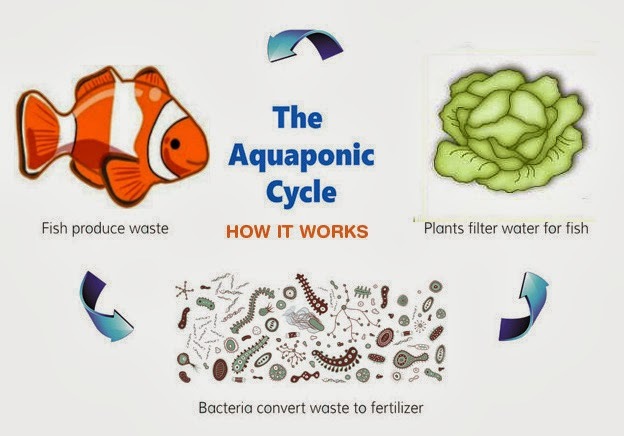 Aquaponics solves many of the problems and environmental issues associated with aquaculture and hydroponics while retaining the benefits of both. Today's modern aquaculture systems are great at growing lots of fish in a small area, but produce lots of fish waste that must be dealt with. Hydroponics offers many benefits including the fact that it is more efficient than soil farming in both density, growth rate and can be done almost anywhere. But hydroponic systems use man-made chemicals as feed and must dump the nutrient solution periodically when salts or pathogens build up which is a waste management and pollution issue. The microorganisms in an aquaponic system turn the "waste" in aquaculture into the valuable input for hydroponics. This more natural input results in food that is healthier and better tasting. The filtered water from the plants is then returned to the fish thereby closing the loop. This conserves water and avoids waste management issues and pollution. The beneficial microorganisms also create an environment that hinders the harmful organisms that are such a problem in hydroponics and aquaculture. The result is truly something that is greater than the sum of its parts.